'Godzilla: King of the Monsters' will be released next year. The very first teaser trailer for the forthcoming 'Godzilla' sequel is unveiled but, before you get too excited, it's worth noting that it gives absolutely nothing away. It's just forty seconds of Millie Bobby Brown's most ominous acting, but we're already eager for the next clip. All we get from the plot of 'Godzilla: King of the Monsters' is that Project Monarch is still very much active, but it's been hugely compromised. The teaser clip sees a casually dressed Millie as Madison Russell with white wraps on her hands, attempting to access Monarch Sciences via a radio system which appears to be set up in someone's home. Brown has deactivated her primary Twitter account this week, which had 2.3 million followers, apparently in response to the meme. Millie Bobby Brown has deleted her Twitter account after being on the receiving end of a targeted campaign of homophobic abuse. The 14 year old actress, one of the young stars of Netflix’s smash hit ‘Stranger Things’, has been the face of an ironic Twitter trend in which Snapchat photos and footage of her have been edited to make it seem as if she’s endorsing hatred of gay people. In reality, Brown is one of the most vocal champions of LGTBQ+ rights. The British star has, as of Wednesday (June 13th), deactivated her official Twitter account which had more than 2.3 million followers. However, a second account, which Brown set up last summer to help tackle bullying with the handle @Milliestopshate, is still active, as is her Instagram account which has 17 million followers. She is being criticised for kissing her boyfriend of seven months. It's hard enough going through puberty without having to do it in the public eye. Millie Bobby Brown is clearly finding teen life hard under such a spotlight, and it's forced her to delete a lovely snap of herself and her boyfriend innocently sharing a kiss on the beach on social media. The 14-year-old 'Stranger Things' star has been dating her boyfriend Jacob Sartorius since October - and seven months is a long time for a teenager. She's constantly being accused of growing up too fast though and, for a lot of fans, proof of that came with a photo of her kissing her boyfriend against a nighttime beach backdrop. Her beautiful caption read: 'Moonlight with him'. She's the youngest ever to make the list. The world's 100 most influential people have been named for 2018, and making history by landing on that list is Millie Bobby Brown. She was among the artist category, and writing their statement about just how inspirational she is was her good friend and superfan Aaron Paul. The 'Stranger Things' star is now the youngest person ever to have made the Time 100 list, being just 14-years-old. But it's well deserved. She joined the likes of Tiffany Haddish, Nicole Kidman, Roseanne Barr, John Krasinski, Cardi B, Hugh Jackman, Meghan Markle and many more on the most respected showbiz list of the year. The creators of the show opened up about the new season at PaleyFest. 'Stranger Things' fans can start getting excited again as it's revealed that production for season 3 is set to begin this month. Few details have been revealed about the new season, but the cast and creators did give a hint as to what to expect during their PaleyFest panel discussion. There's been something of a silence following the end of season 2 of the Netflix show. 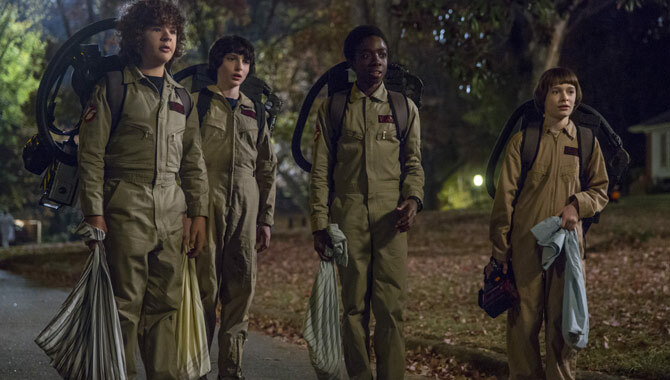 It seems Eleven, Lucas, Mike, Will and Dustin had finally managed to defeat the demogorgons with the help of some new faces, with the Mind Flayer having been forced back into the Upside Down. So what's next for these kids? When no-one showed to a young fan's birthday bash, the cast stepped in with words of comfort. Say what you like about 'Stranger Things', but those young actors are without doubt the sweetest people on this Earth. Millie Bobby Brown and Gaten Matarazzo made one fan's day after comforting them when no-one showed up to their incredible 'Stranger Things' themed birthday party. For most of us, if someone we know was throwing an Upside Down party, we'd be there in a flash. But one young Filipino boy was left distinctly disappointed when none of his friends turned up for his bash - a real shame given the amount of effort that had clearly gone into preparations. His older sister took to Twitter to share the sad story.